The Holeshot H-D is wider than other trail riding and racing tires, which helps it to climb out and stay out of ruts. Assisting in this ability is a new, stepped shoulder knob design that provides an additional degree of side bite and rut control. Overall traction and mud clean-out has been enhanced with larger, wider-spaced lugs. Completely re-engineered to handle the most extreme trail conditions possible. 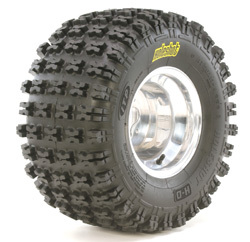 Wider than other trail riding and racing tires, to help climb out and stay out of ruts. New, stepped shoulder knob design offers and additional degree of side bite and rut control. Larger, wider-spaced lugs provide a whole new level of traction when it's needed most. The only choice for woods and desert racing! This tire's durability has been increased as well, with a special focus on the sidewall that's resulted in unmatched puncture resistance. And despite the rugged nature of the Holeshot H-D, it remains surprisingly light. Find your tire size in the chart above and then select your tire size below for ordering. Prices vary by tire size, and start at $93.95. The price listed above will match the price of the item added to the cart.